D-Day for Greece and EU: Deal, delay, or default? It might sound like a game show title, but it's all very real for Europe. Officials will meet Thursday to try one more time to strike a deal that will keep Greece solvent in return for economic reforms. Everyone is hoping for a deal. But judging by the ugly rhetoric, Greece's creditors are not willing to offer any more compromises. The only way for an agreement to happen is for the Greek government to back down. Prime Minister Alexis Tsipras remains defiant. On Tuesday, he accused the International Monetary Fund of "humiliating the Greek people" and stood by his anti-austerity demands. He might be bluffing. There is at least one big reason for a last minute U-turn: 70% of Greeks want to stay in eurozone at any cost, according to opinion polls. If Greece agrees to the reforms outlined by its creditors, they'll release the last 7.2 billion euros ($8.1 billion) from the international bailout fund, and Athens will be able pay the IMF the money it owes this month. 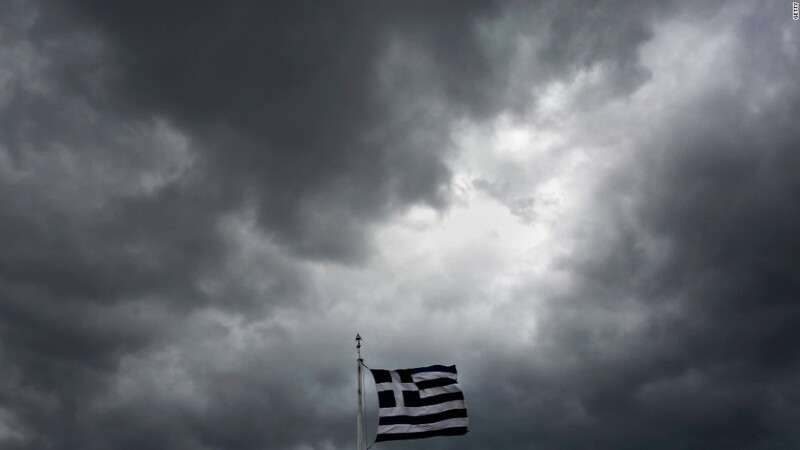 If Thursday's talks end in acrimony, Greece will slip further towards the economic abyss. The country must pay the IMF 1.54 billion euros by June 30, which is also when its bailout agreement is due to expire. "There is no grace period," she said. Greece then owes 6.7 billion euros to the European Central Bank in July and August. It does not have access to international credit markets and without the bailout money, it would have to default on its debts. Even though it has until the end of the month, no deal in the next few days could be the beginning of the end, because savers are likely to start pulling more money out of Greek banks, fearing the worst. A deep financial crisis and capital controls would likely follow. The government would ultimately be forced to adopt a new currency in order to pay pensions and public sector wages. But perhaps most likely is another fudge. Europe has a history of kicking the Greek can down the road. Deadlines branded as final have been missed many times in the past five years, and it is possible that EU leaders will find another way to muddle through. European officials could present Greece with a "take it or leave it" offer on Thursday, giving it until EU leaders meet next week to respond. Even then, that might not be game over. German newspaper Bild reported earlier this week that Greece may have found a way of delaying its IMF payments by six months. That could in theory buy a little more time for talks.